After doing evening chores in the golf cart, we race Ira on his bike through the pasture. Peals of laughter are heard from up ahead, where Ira is proudly surpassing the golf cart’s speed. 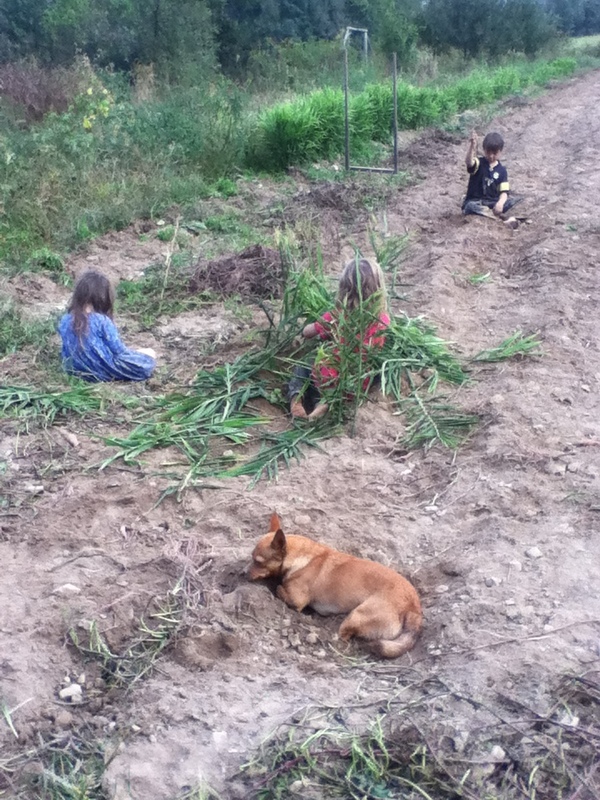 While harvesting ginger, the children gather the discarded stalks to make houses, learning about balance and structure (and sub-consciously about the texture and smell of ginger plants). While digging sweet potatoes, the children (and Eric, too) would see who could find the craziest shaped root. We found ducks, pigs, footballs, and even a very grinch-like specimen. When they got tired of grubbing for roots, they would just sit and enjoy running little fingers through the soil and eventually move on to burying a very tolerant chihuahua in the loose dirt. Eric and I chose this particular way of living, knowing that someday we would share it with our children, too. I knew that I wanted to homeshcool my kiddos; to be in their presence each and every day. It isn’t always easy, though. In fact, some days we find it incredibly challenging trying to hold down the fort while also maintaining the flow of our farm business and all that goes with it. I know I have said this before. Many times, in fact. I just don’t want to give the unrealistic impression that my life is perfect and our days flow seamlessly from one moment to the next. It’s a far, far cry from that. But we do try. We make great efforts to incorporate our children into our days. Not by always asking them to do what we are doing, but by allowing them to be by our sides while we work, to help if they choose and if not, to find something to do that doesn’t hinder anyone else. And this is where play comes into our daily picture. We definitely give ample space for play; free, unbridled play. Play is pretty important around here. Play is our saving grace. Play is the humor when things get a bit too serious. Play is a huge breath of fresh air. Play is what happens while we go about the thick and thin of our days. If the entire family is working in the garden together, we rely on play to serve as the bridge between our work and our family relations. If we are doing schoolwork in the house with one child, usually the other two find their niches playing with dolls or drawing. Sure, sometimes the children would rather fight than play. Sure, sometimes finding our playful sides takes quite a bit of effort. Sure, sometimes very busy days leave us feeling cranky and not at all like playing. Reality is what it is. However, I make it a point to not over-schedule my children’s days (Partly for selfish reasons because I don’t want to spend excess time driving them to and fro, and mostly for their own sakes because I don’t want them to remember their childhoods in the context of the minivan.) giving us all the more time to just play. Honestly, it breaks my heart to think that children nowadays are beginning to lose the ability to play. Wait. That’s not what I mean to say. It’s not that children are losing the ability to play, it’s that the adults in these children’s lives are not honoring the value of play for children and are not allowing time for it in the midst of tight schedules and standardized tests. I’ve heard and read that many public schools are taking away recess time as well as physical education classes (where children can at least move their bodies!) to make way for more classroom time spent staring at computer screens. Our society is so determined to crank out little robots that are trained to the 9 to 5 regime that we are forgoing the precious and extremely short time of childhood. Playing needs to be incorporated into our days more, not less. What I’m talking about is free, unscheduled, uninterrupted, unplugged play. Play time for children is critical for their healthy mental, physical, and emotional development. Let’s chuck the video games out the window and make space for real play. Are you with me? The opportunities for playing are limitless no matter where you are. Fancy toys and gadgets are not required. 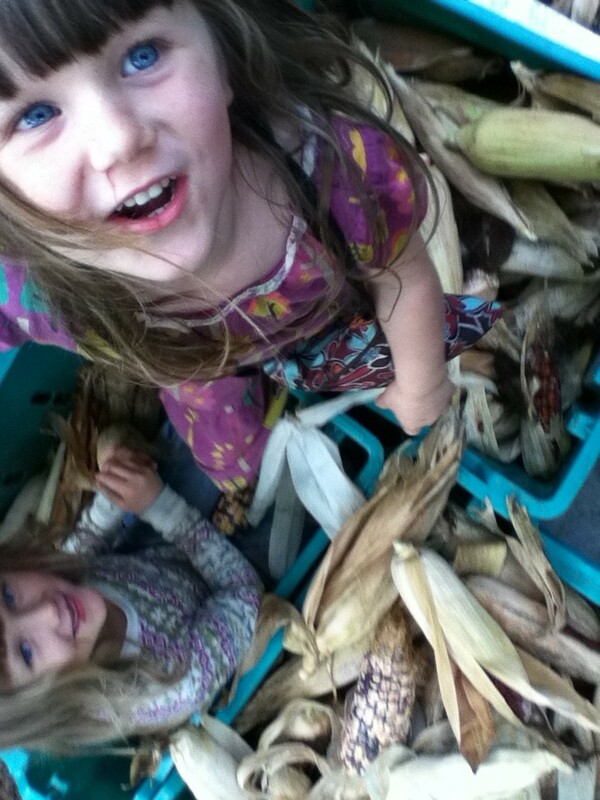 This entry was posted in cher's posts and tagged creative play, homeschool, life, life learning, play, unschool by cher. Bookmark the permalink. I just finished reading an article about the positive values children can learn from playing minecraft. I have to say, it kind of freaked me out. Real human contact with their parents and others, real contact with nature, and experience doing real things are, as you state here, some of the keys of mentally and physically healthy children. Thank you for stating it so well, Cher! Oh, Barb, I don’t even know what minecraft is! I’m gathering it’s a video game(?) by the tone of your writing. This, too, makes me sad. To think that video games are replacing real human interaction! Our 8 year old Ruth still dreams of living on a farm and I know it was largely inspired by our visit to you! Of course Will and I dream of it, too and hope to find a place with more outdoors soon. Every once in a while I think how nice it would be to have an outdoor kitchen so I could watch my kids play outside while I cook! I love how you connected play with balancing and helping relieve the stress of life. I miss playing with your beautiful, kind children, Cher! They really are blessed to have the life you’ve given them. It’s so lovely to hear from you, Lisa. I hope your sweet family is well. We miss you all, and my children still fondly remember all of the library time last summer. My children have opened my eyes to so many things in life that I would have never even considered without them. I am so blessed by the life they have given me!